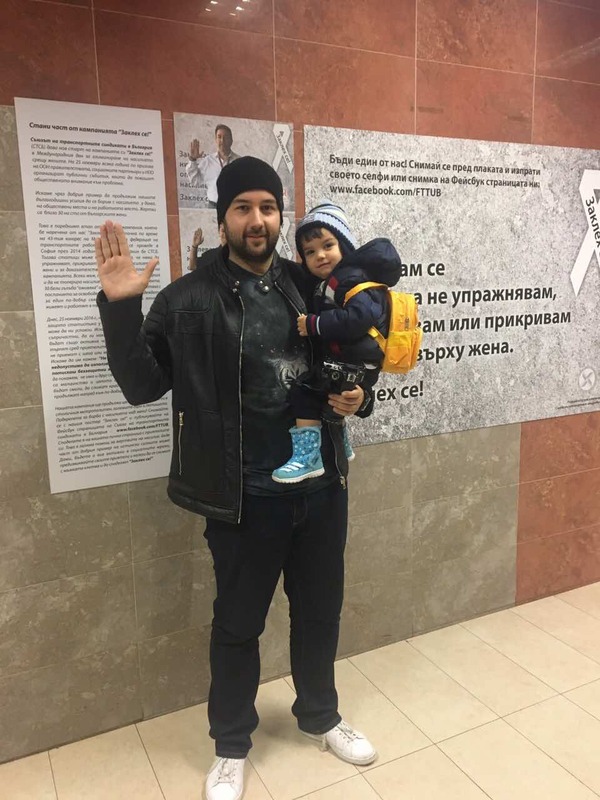 With these simple but powerful words of the men’s oath uttered on the International Human Rights Day, FTTUB again drew the attention of Bulgarian men and the entire society towards violence against women. 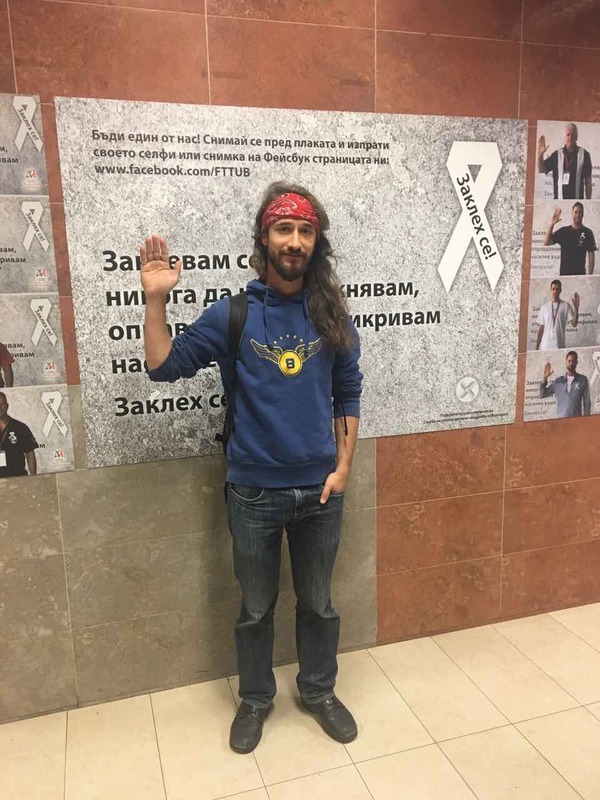 On 10 December, members of FTTUB’s Youth were once again in the Sofia metro, where citizens took pictures in front of the panel of the oath and thus gave their vote for a world free of violence! 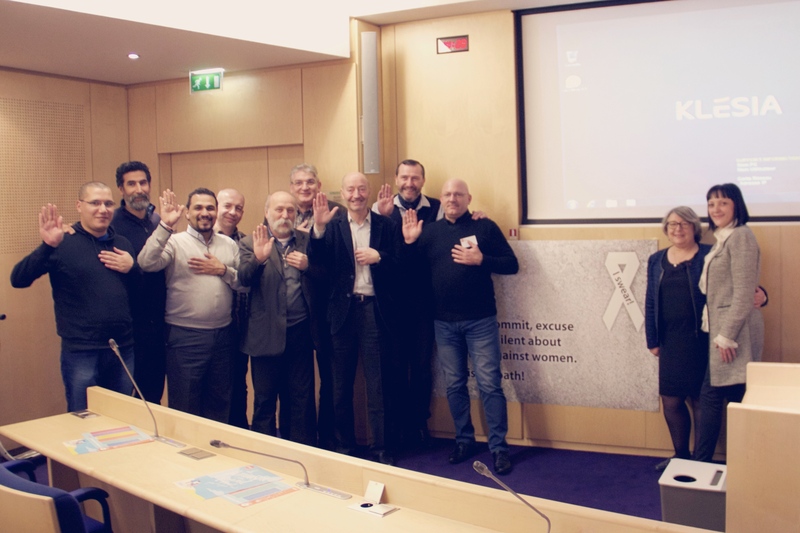 We symbolically gave a White Ribbon, along with our gratitude, to all organizations and institutions, and to the hundreds of people who supported the ‘I swore!’ campaign from its launch in the summer of 2014 until now. We give thanks Michelle Myers and the Maritime Union of Australia (MUA) – for having inspired us for this campaign with their own example! 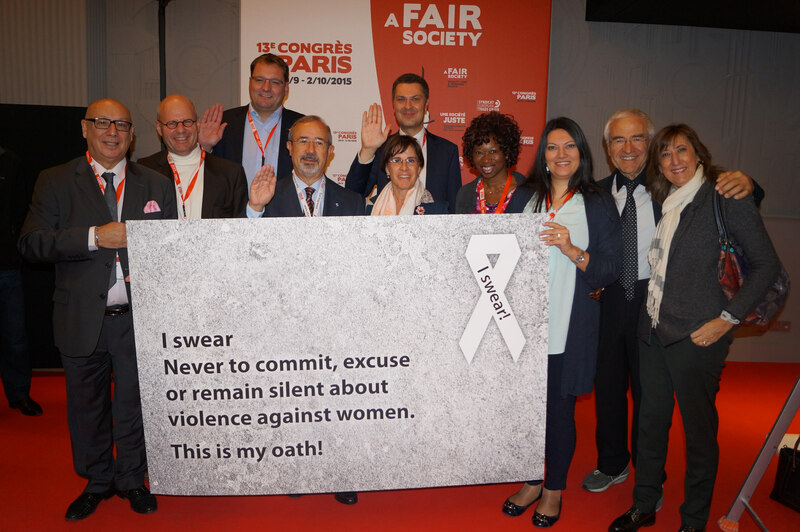 We thank Paddy Crumlin, Stephen Cotton and the International Transport Federation (ITF), which recognized the enormous importance of the campaign during its congress in Sofia in 2014 when hundreds of men, led by ITF leadership, have sworn the men’s oath. Thanks to the French Confederation of Labour (CFDT) and Valerie Latron for their unreserved support for our campaign during their national conference on 8 March 2015. Thanks to Luca Visentini and the European Trade Union Confederation (ETUC), who also joined the campaign during its congress in Paris in autumn of 2015. 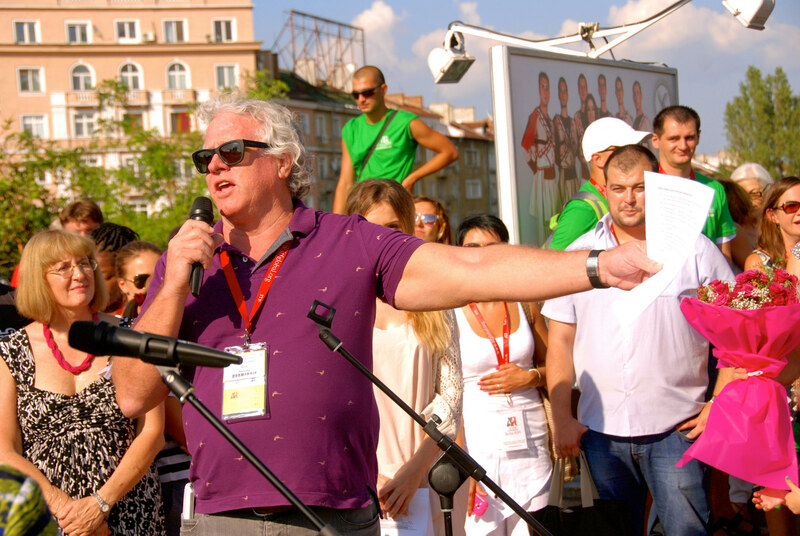 Thanks to Bulgarian singer Elitsa and ensemble “Chinari” who endorsed the campaign in 2014. Special thanks to Bulgarian actress Iskra Radeva who chose to be the official face of ‘I swore!’ campaign for 2016-2017. Thanks to the Confederation of Independent Trade Unions in Bulgaria (CITUB); to Todor Kapitanov and “Youth Forum 21st century”; to the Workers Confederation College and its director Yulia Simeonova; to the University of National and World Economy (UNWE); to GERB women – Sofia. 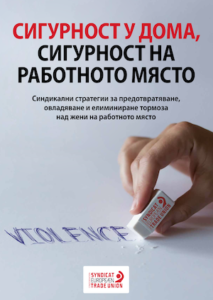 Thanks to Sofia Metropolitan and its managing director Mr. Bratoev, and to all employers with whom we have a fruitful social dialogue and real advances in the prevention and elimination of violence against women in the form of clauses in our CBAs. Thanks to Sasho Aleksov, leader of our organization at the National Railways and infrastructure, and Bozhidar Danchev – leader of the organization at the Centre for Urban Mobility Sofia. Thanks to all our leaders, members and activists who participated wholeheartedly in the campaign! Thank you to all these Bulgarian men who have taken the oath in days from November 25 until today – we can not list you by name, but we hope to meet all of you personally at the ceremony in 2017!. With this symbolic act of gratitude FTTUB marked the last of the 16 days of activism of the United Nations in 2016, dedicated to public events which work for changing the society’s attitudes and to prevent violence against women and girls. In its 2030 Agenda for Sustainable Development, adopted at the summit in 2015, the UN outlines 17 sustainable development goals and 169 related targets which address all the essential aspects of human rights. Among them, achieving gender equality and the empowerment of women appears as a crucial goal which would assist the progress in achieving the other goals and objectives. FTTUB also sees a direct link between the achievement of equal rights for women and men, and achieving the goals of 2030. In all our actions and campaigns for women, in all our interactions with employers and institutions, we have always pointed out that an environment where women’s rights are protected by strong laws and guaranteed by effective mechanisms, is an environment in which everyone – both men and women – live better. We therefore call on Bulgarian men to choose activity over the silence and give their voice in support of a humane and just cause. Protect the right of women and men to live, work and create without fear of violence! Join the growing community of ambassadors of harmonious relations between man and woman, and support the ‘I swore!’ campaign. Its goal is not only to protect women, but also securing a more humane, more developed and more conscious society in which hostility, hatred and violence have no place, and people resolve conflicts with each other by means of dialogue. Our campaign continues in the coming days, weeks and months – until November 25th 2017, when will we recapitulate what has been achieved during the year and will hand out White Ribbons at a special public ceremony at which we expect to meet all men who have taken the oath. The Universal Declaration of Human Rights was adopted by the UN General Assembly on 10 December 1948. It has been translated into at least 375 languages and dialects, making it the most translated document in the world. It consists of 30 articles, which are further elaborated in subsequent international agreements, regional instruments for the protection of human rights, national constitutions and laws. The main body dealing with issues of human rights within the UN is the Commission on Human Rights at the United Nations Economic and Social Council, including representatives of 53 member states of the UN.